I have an American pattern for a short sleeved top, but it's says use a medium worsted and 3.75 needles with a a gauge of 22sts x 33rows. How can I achieve this , do I use an English Aran or DK an d at what size needle? If I was knitting the pattern I would use a DK or 8 ply yarn with 4.00mm needles to get the tension specified in the pattern. The tension is pretty close to the recommended tension on most 8 plys available here in Australia and usually the recommended needle size is 4.00mm. 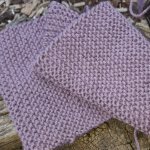 I tend to knit with a tension that is close to that, so I do not have to make any adjustments to get the width and length of my knitting to match the pattern. I suggest that you start with a tension square to match the tension in the pattern.